Quality is a fundamental value of our products. We believe our patients and consumers deserve consistent and reliable, high quality every time they use or experience a Johnson & Johnson product. We work hard to make this happen by instilling and maintaining a proactive quality excellence culture throughout the enterprise. The focus on quality starts at the top with our Chairman & CEO and our Executive Committee. 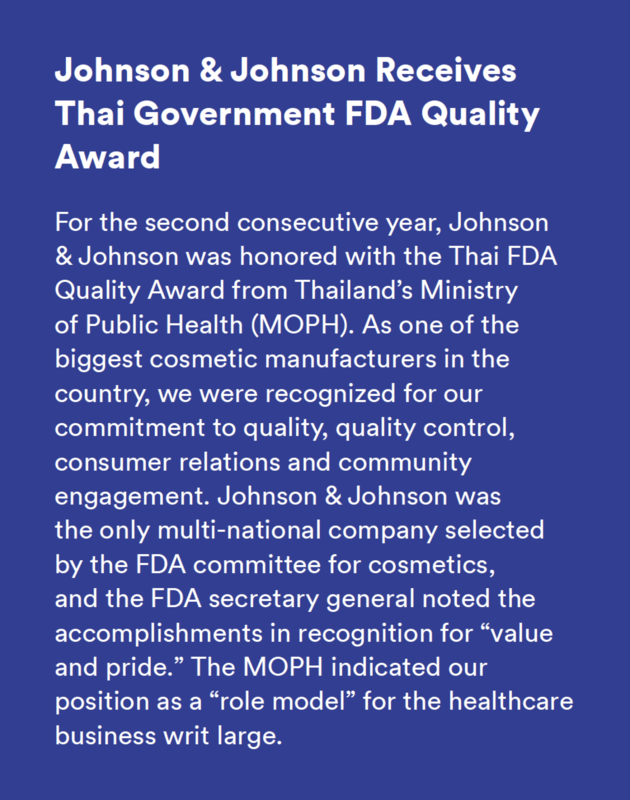 They, along with the Chief Compliance Officer and the Chief Quality Officer, advocate that all employees must contribute to our enterprise-wide Quality and Compliance Core Objective established by the Johnson & Johnson Board of Directors. It is the responsibility of every employee to adhere to the principles set forth in this enterprise-wide Core Objective. Moreover, the Core Objective is considered in the evaluation and compensation of all Johnson & Johnson employees. Led by the Chief Quality Officer, our global Quality & Compliance (Q&C) organization has harmonized quality management by ensuring consistent implementation of quality systems across our Family of Companies. Global Q&C has oversight of quality and regulatory compliance across the enterprise. It establishes the enterprise-wide Johnson & Johnson Quality Policy and Quality Standards. Its scope includes quality management activities at all stages of a product lifecycle, from R&D, to manufacturing and commercialization. Our R&D and manufacturing sites have designated Quality heads to establish, implement and maintain quality systems at the site and ensure quality regulatory compliance. Continuous enhancement of talent and capabilities through training and education. Our Quality Policy and Quality Standards are consistent with the guiding principles set forth in Our Credo and the Johnson & Johnson Quality and Compliance Core Objective. These define the requirements that our operating companies across Johnson & Johnson must achieve to design, make and deliver our products. They provide a common foundation for quality systems across the Johnson & Johnson Family of Companies. The requirements are based on current Good Manufacturing Practices (cGMPs), International Organization for Standardization (ISO) series and Johnson & Johnson best practices. These Quality Standards are put in place worldwide to help assure the quality of our products for our customers and to assure the operation of our businesses in compliance with regulations. We have established a closed-loop, independent audit approach to help ensure our facilities and external manufacturing sites operate in compliance with our internal Johnson & Johnson Quality Standards, as well as global health authority requirements. Our Quality Audit Program applies to all Johnson & Johnson facilities that manufacture, store or distribute product. It also applies to external manufacturers that provide materials, products and services to our businesses. It is through this Quality Audit Program that we monitor, assess and identify opportunities to continuously improve the effectiveness of our quality systems. From 179 independent audits completed in 2017 at our internal sites, the majority resulted in no critical findings. In addition to our monitoring programs, there is a Management Review process that is built into the quality system of each operating company, mandating its executive management to review the effectiveness of the elements of the quality system, and to require improvements where necessary. These Management Reviews are conducted every six months. When appropriate, sites found to require improvements in their operation develop corrective action plans to systematically improve their quality systems and to prevent a recurrence of any deficiencies. Such ongoing proactivity helps us “self-detect” and “self-correct” potential issues to ensure compliance with regulatory requirements. 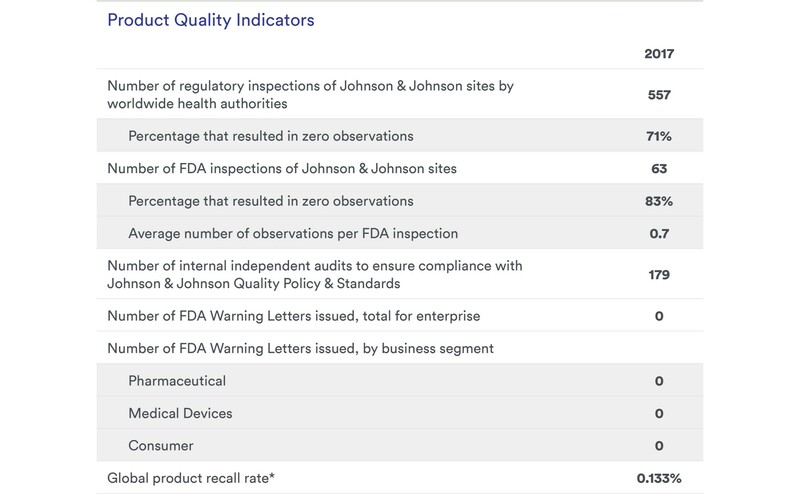 Results, status, and progress are all reported to business leaders and the Johnson & Johnson Family of Companies’ governing bodies to help them support their sites’ efforts to achieve compliance in a timely manner. Regular updates on this topic are provided to the Regulatory, Compliance & Government Affairs Committee of the Board of Directors. Each operating company also has a formal Quality Review Board. These consist of leaders from Quality & Compliance, Medical Affairs, Medical Safety, and Regulatory Affairs, who convene as necessary to evaluate any concerns with the quality of product in the market, and to decide, independent of commercial considerations, whether actions need to be taken on the product in the market. Such actions may include proactively recalling a product, if needed. Patient and consumer safety supersedes any other factor in this decision-making. Risk management requirements are part of the Johnson & Johnson Quality Policy. They require that quality risks throughout the product lifecycles be identified, assessed, and mitigated or minimized. In addition to mandatory product risk management principles, we developed a proprietary risk mapping tool to identify, assess and mitigate risks across the entire manufacturing value stream. Based on a comprehensive data-driven methodology, the tool helps identify opportunities for strengthening quality controls at every phase of a product lifecycle, thus enabling continuous process improvement and proactive quality control. Based on successful application of the tool at our internal manufacturing sites, we are piloting its use at several external manufacturing sites. Continuous improvement of the skills and capabilities of our employees is essential in ensuring personnel have the competence needed to perform their responsibilities within health authority regulated activities. All applicable employees receive extensive trainings on their responsibilities under the Quality System. Our Quality Training Academy is a centralized platform for our quality employees worldwide to access training and development opportunities. In addition to mandatory trainings, we offer several learning and professional development courses. We apply the same training and education philosophy to our work with suppliers. Through our Supplier Quality Academy, we provide training to suppliers and supplier-facing Johnson & Johnson employees to build and strengthen strategic competencies that impact the overall quality and performance of the end-to-end supply chain. Over years, we have identified many best practices that improve the quality of our products and processes at our sites. The Supplier Quality Academy enables us to share those learnings with our suppliers and external manufacturers. The platform offers several courses delivered through a variety of training methods – from face-to-face instructor-led trainings to virtual instructor-led conferencing and self-led online modules. Patient and customer safety and product quality are paramount considerations in our approach to integrating new acquisitions. 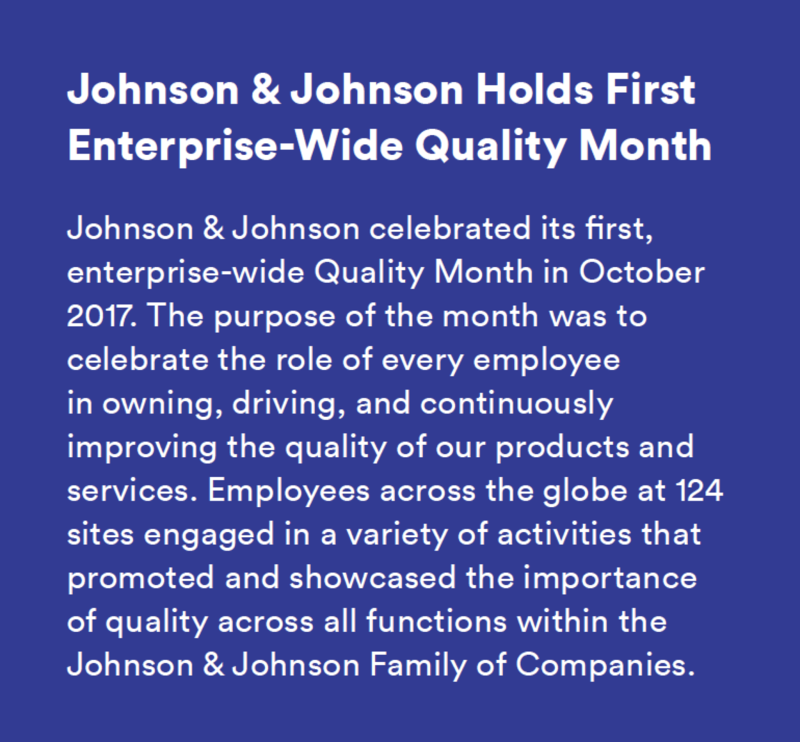 We have a well-defined process in place to ensure that when a new company joins our Johnson & Johnson Family of Companies, we take prompt measures to align that company’s quality system to our Johnson & Johnson Quality System framework. Our Quality teams participate in the due diligence activities during the acquisition process and conduct detailed risk assessments of quality systems and processes. The risks are prioritized, and action plans are developed to ensure compliance with our internal Quality Policy and Quality Standards. * Product recall rate is defined as number of lots removed from market per total globally manufactured, based on all field actions that are removals.